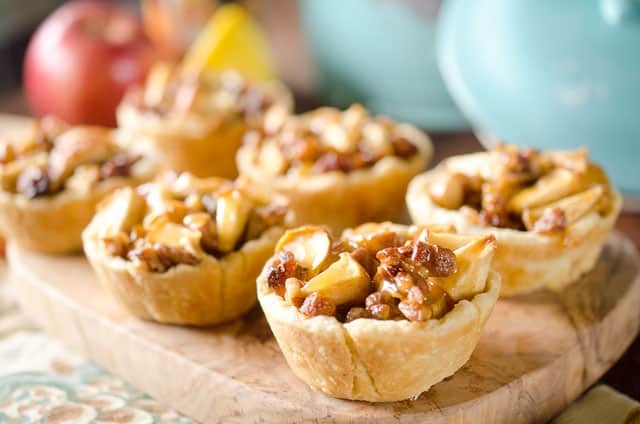 Caramel Apple Mini Pie Cups are a sweet little bite of apple pie loaded with pecans, raisins and drizzled with caramel for the perfect party appetizer or snack! 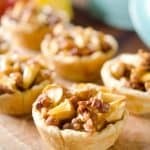 My apple tree is full of tart delicious apples and these Caramel Apple Mini Pie Cups were the perfect way to enjoy them! 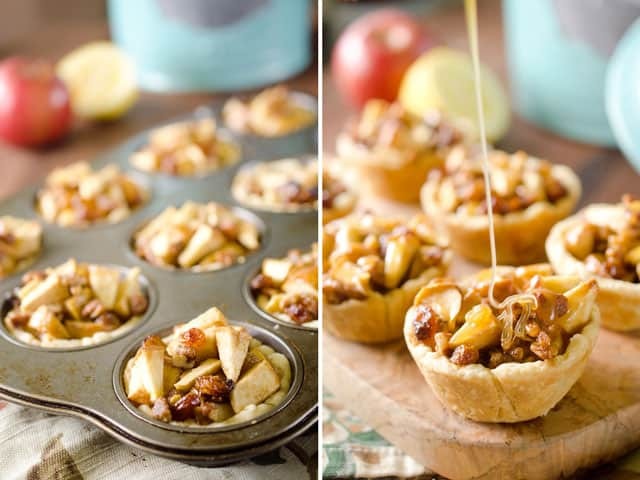 Muffin tins are lined with pie crust and filled with chopped apples, pecans, golden raisins and drizzled with caramel sauce for the perfect finger food for a holiday meal or party. 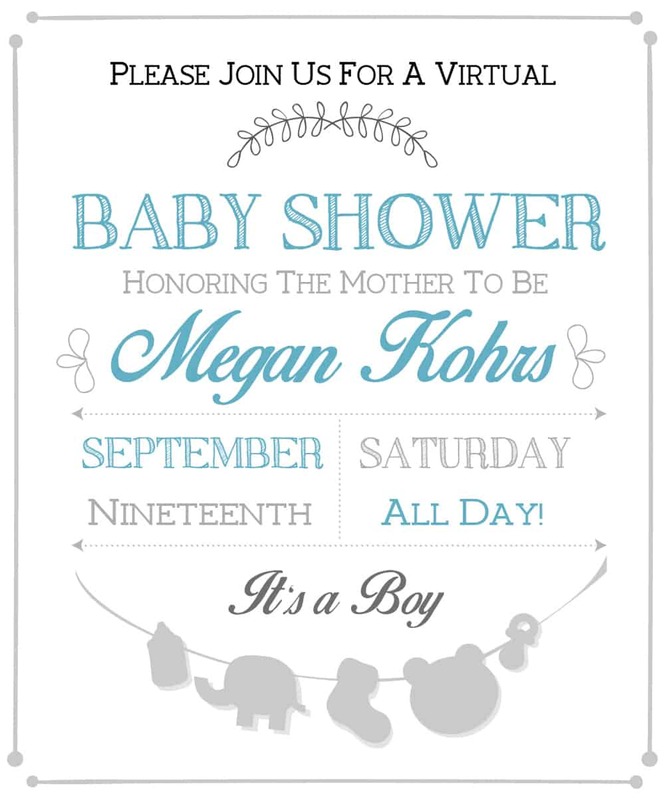 Speaking of parties, today we are celebrating with a baby shower for Megan from With Salt & Wit! Megan is one of the fantastic members of our Weekly Healthy Meal Plan, so you probably see her face around here quite often. 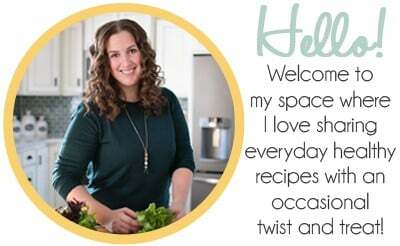 She makes tons of healthy and delicious meals that I love seeing in our weekly menu. Megan and her husband will be welcoming a baby boy to their family very soon so we all got together to celebrate with a virtual baby shower featuring lots of fall sweets and treats! Not only should you check out all the other amazing treat that Megan’s blogging friends have prepared below, but also be sure to check out some of Megan’s amazing creations. From these Chocolate Dipped Peanut Butter S’mores to this Red Velvet Cookie Dough Brownie Parfaits, she is always thinking up something new and creative! Be sure to swing by Megan’s blog or Facebook page and send your well wishes her way for her growing family! Preheat your oven to 375°. Spray one muffin tin with non-stick cooking spray and set aside. Meanwhile, prepare your pie dough and cut the rolled out dough into 5"-6" circles and press in muffin tins. Store refrigerated until your apple mixture is prepared. 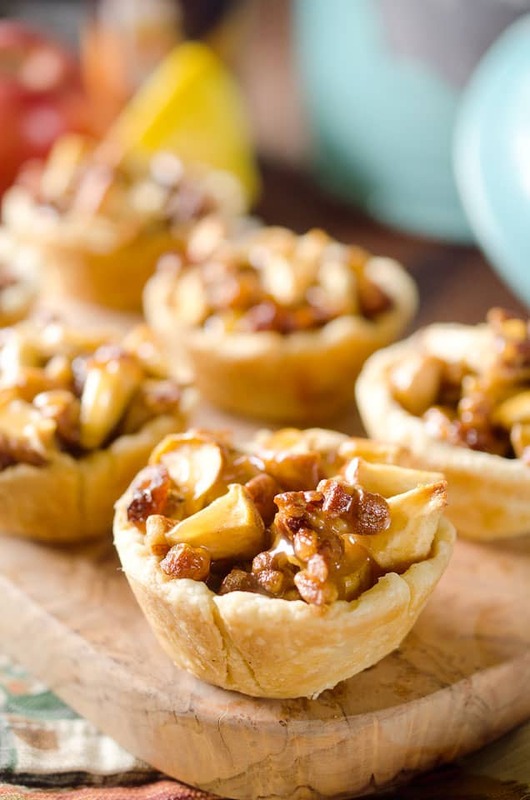 In a large bowl, toss the chopped apples with butter, lemon, cinnamon, vanilla, brown sugar, flour raisins and pecans until everything is well coated. Scoop 1/3 c. of the mixture into each mini crust and bake at 375° for 35-40 minutes. 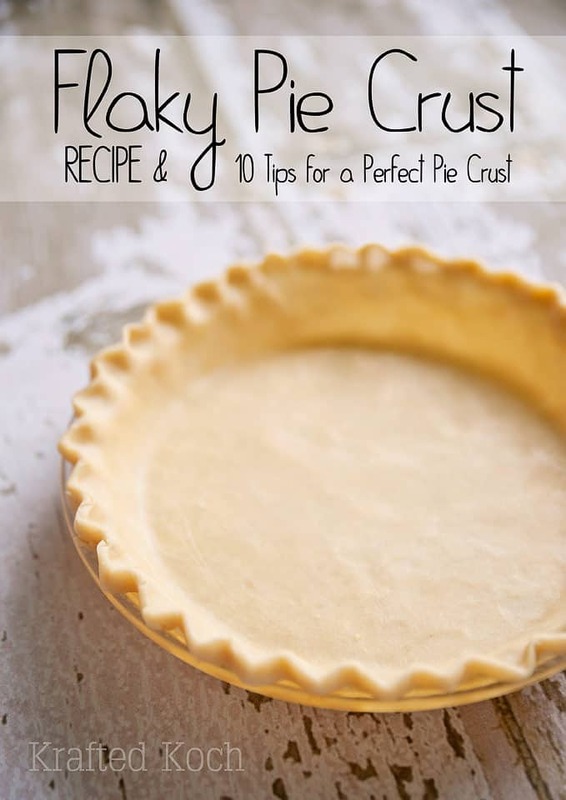 Allow to cool for 10 minutes and remove each pie from the tin. Store sealed or serve immediately. Jealous of your apple tree! And now I’m totally craving these little bites. I could eat that whole tray probably! So perfect for Fall and for Megan’s shower! Oh my goodness! WHAT have you gals done?! I am so flattered and beyond hungry now after seeing all this delicious party food! 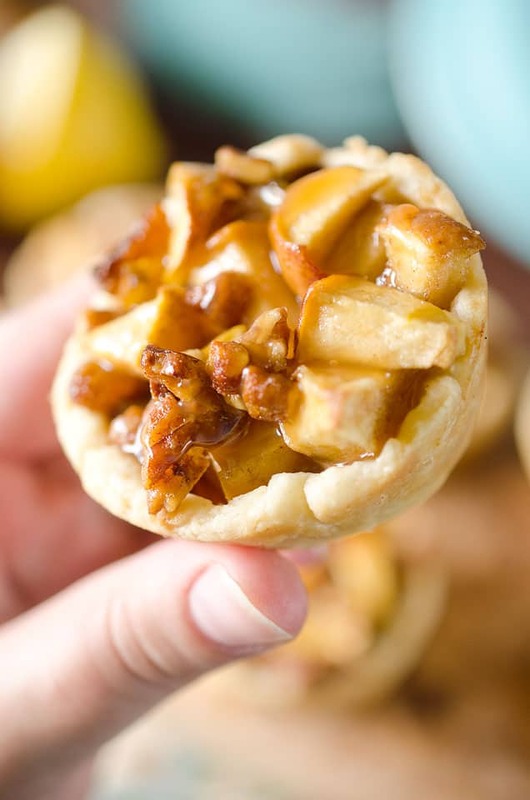 You are so sweet and I can’t think of a better way to celebrate fall than with bite size apple pies! Because tiny foods means more food, right?! 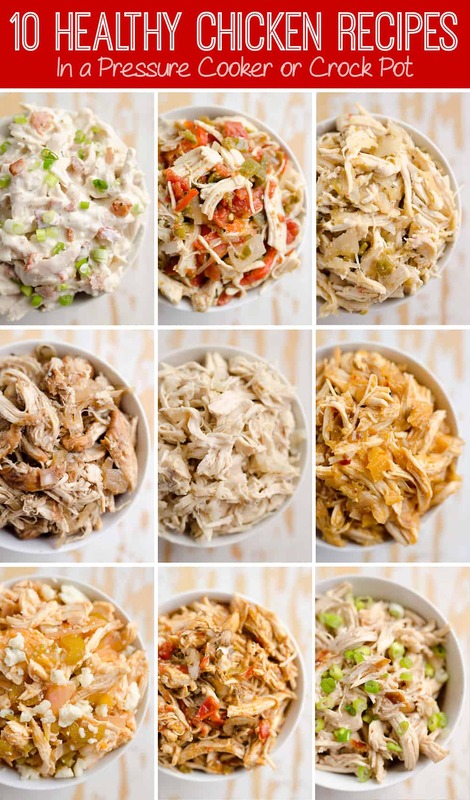 I drool on my keyboard a little every time I see these delicious bites!